Every system setup comes with a decision chain. Here, we'll look at the various common charger, connector and aircraft layouts and you should be able to determine after scrolling through this basic primer what you need, what to order, and how to set it all up. Be sure and visit the A123 FAQ for technology comparisons, care and feeding notes and general LiFe support information. Where to start? The Charger... What you have vs. What you need. The most basic circumstances of any equipment layout starts with the support equipment and the requirements to check and charge the system's packs from outside the plane. Via Basic Flight Line Darwinism we've learned that it is utterly crucial to check and observe individual cell voltage of A123 packs, we've also learned that maintaining the cell balance of the pack is critical to the 'fly - no fly' decision. Just as we know we can't use a Turbine without the right field gear in support and so it is with A123 batteries, you are definitely going to need an A123 compatible balancing charger and access to the pack to check the cells. Sounds simple enough.. unfortunately, as with most evolving new technology, the perceived needs and the equipment have changed a bit. 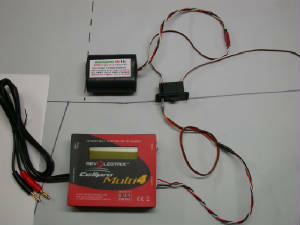 As of this writing (late spring 2009) we're into the second generation of A123 compatible chargers. It's possible you already have an A123 compatible charger. Quite a few of the 'lithium capable' mutli- chemistry chargers already have LiFe or A123 charge or balance charge support. They also have two output cable arrangements.. the banana plug 2 wire output for NiCad and NiMH packs and a molex connecting strip, aka 'balance boad', for lithium balance charging. Some use only the balance tap on the A123 for charging. First Generation Chargers: These share a common trait... they require either an external balancer or if equipped with an internal balancer, that balancer requires a second set of leads connected to the pack for balance charging. We'll call 'em 'Two Lead Balance Chargers' for convenience in identifying their specific cabling and connector requirements on the pack. These chargers are very easy to spot.. they use a two wire lead for fast/unbalanced charging, usually from a banana plug type output AND they have a three or more wire 'balance charge' cable, usually a little white molex type charge socket on the side of the charger to accommodate it and/or an external adapter/balance board. Second Generation Chargers: These are easy to spot... they have only one output port (per pack) and it's ALWAYS a 'molex' type port. 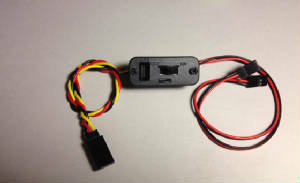 Various pack connection types are handled by the simple expedient of adding a RC system standard charge connector to the end of the molex cable they provide to fit the little molex port on the side of the charger. 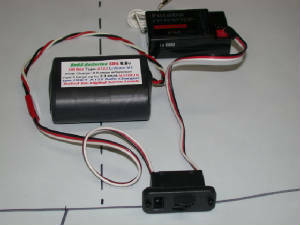 In the case of the FMA charger (shown) lithium packs are available with the matching balance tap plug built on them to connect directly to the charger... but with A123 packs (and with giant scale airplanes) pulling the pack out of the plane to make it accessible to the balance charger can be a mite problematic. We still reccomend a Univ cell tap on the pack to facilitate in-plane charging. We'll show you two ways to get that done in the 'Switches' discussion further down the page. 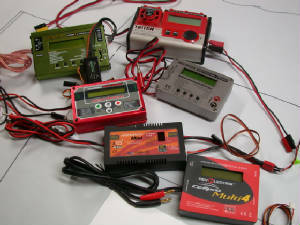 Now, there's several routes your decision chain can take.. and again; before we can decide what pack connector configuration you need we have to decide how your going to set up power delivery from the pack to the radio and servos and how we're going to give the balance features of your particular charger type acess to charging the pack. Comparative Advantages between 1st & 2nd Generation Chargers: While both types get the job done, the big difference amounts to the ease of connecting up an A123 pack for charging in the plane. With a 1st generation charger a second charge port is normally required.. as well as a seperate 'tap' on the pack to connect it to in addition to the usual system connector to the switch. 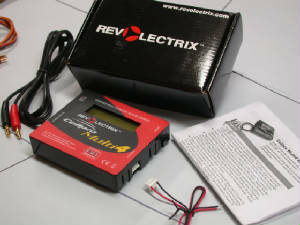 This means the Rx pack will have two connectors... one prime feed to the switch and off to the Rx and servos.. the other for balance charging. With some 'generation 1 chargers' that meant you needed 2 connections to every pack being balance charged and as a result, 2 charge ports on the side of the plane for field charging each pack. Below are some examples of what a 'standard' two cable balance charging connection looked like, alongside a single cable charging setup to the right. Generation 2 chargers require only one connection to the pack.. and with a simple modification to your existing HD Chargeport switch (we'll cover that in the Switches section) will allow balance charging through the switch chargeport... without any other holes in your plane. Fear not.. if you have a 1st generation two cable charger, there is also a solution for that, we'll also cover that below. What we're looking at here is a fast 'pen' line drawing to scale for a 27% Extra with the prime components of a simple single pack system. 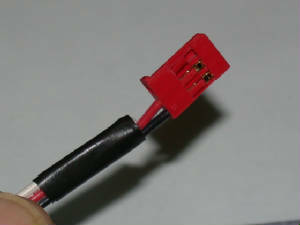 Note that the packs 3 wire Univ celltap meets a 6" std aileron extension that plugs into a Univ Ernst type chargeport. This allows access from outside the plane to balance charge the pack with a simple Univ Celltap to Charger Cable. This can't be done (access from outside the plane) with an FMA or ThunderPower, etc, type molex celltap on the pack.. a JST-XH to JR straight adapter cable must be used to connect between the installed extra chargeport and the two lead chargers balance port or balance board. You'll note the chargeport switch is then plugged in to the packs 18g two wire power feed. To complete the charge hookup for the 'standard' configuration you now need a standard banana plug to FJ/JR charge cable to get from the switch chargeport to the charger's banana output ports. 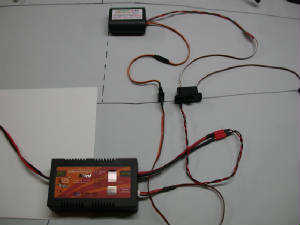 While this setup is a bit cumbersome, it works fine and we still use this layout for very high current drain systems using Deans, EC3 or Multiplex connections routed direct to a power board or power expander.When FMA's second generation chargers arrived on the scene, a second cable connection wasn't required. The FMA chargers adapter cable was plugged into the accessory or second charge port and the pack was handled via that connection alone. More convenient.. but we still had two holes in the plane per pack and two leads on the pack to boot. We set up packs with a pretty confusing array of connectors. To clear up some confusion and make it easier to visualise whats going on with the switch and tap layouts peculiar to A123's, here's some pics of the most common configurations for A123 packs..
Don't see what you're looking for here? All of our A123 Rx, Ignition & Turbine packs and A123 Accessories, including the A123 rated switches discussed below are available on our A123 Packs page. Just click the link in the navbar on the left of the page. Scroll down for A123 Rated switches & Charger cables. Near the bottom of this page, you'll find some package deals.. read on and profit! 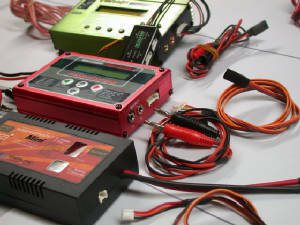 From left to right, the first three packs shown above with their connector setups will easily permit balance charging in the aircraft. The one on the left can permit balance charging thru a standard chargeport switch, (single cable balance charging) The two in the center will do balance charging with the addition of a simple chargeport (two cable balance charging), or via specialised switches. The pack above on the far right with the FMA balance tap is great if you intend to remove the packs from the plane to balance charge since it has a molex type charge connection plug for balancing. 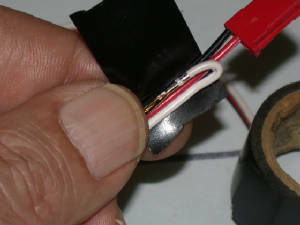 Every RC application requires some way to isolate the battery from the Rx and servos when not in use or being charged. The key common components to accommodate that are a switch and a chargeport. Below left, a Univ Chargeport, below center, HD after-market system switches as commonly used in Giant Scale Applications and our own custom made Combo Switch for A123. Now, lets see how we put 'em to use with the various charger types, pack cabling choices and connectors most often used in Giant Scale. Up until recently, if you had a 2 cable 1st generation balance charger you were pretty much committed to two holes in the plane for each pack to check cell voltages and two cables from the charger to the pack to balance charge as well as two leads on the pack to make it all work.. Some work-arounds involved just doing unbalanced charging at the field and balance charging 'occasionaly'.. suitable for R/C trucks and park flyer foamies, not suitable for a 30 pound Warbird worth about 500 toy trucks and flying burger wrappers. We need to be able to get the charger's balancer in play on every charge and to do that we need a three wire connection to the pack. Enter the NoBS A123 Combo Solution Cable. It's a single cable charger cord that combines the functions of both the output ports on your charger. It's set up with banana plugs for connection to your chargers main power output AND a spliced-in JST-XH balance board/balance port connector on the charger side that mates with 90% of the balancing chargers currently in use. On the pack side, it's finished with a FJ/JR-univ charger plug that will fit any R/C standard switch chargeport. It's a comfortable 18" long; the output section is made out of HD twisted 20g cabling and can handle a full 3-4 amps continuous charge rate. Need it longer? It can be instantly extended with a 20g aileron extension. AND, of course, you get the full benefit of using your chargers balancer features every time you cable up to charge at the field, all through the switch's chargeport. That's right.. no separate chargeport on the plane required. Read on, and we'll show you how! Have an FMA PowerLab?? 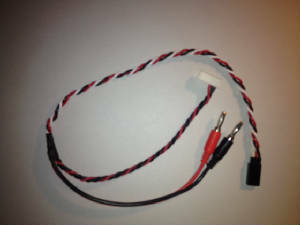 Click here to See our Custom Combo Cable for FMA's Powerlabs on our Chargers & Accessories page. If you've got an existing project with Nicads or NiMH packs in it, here's where we show you how to take advantage of your existing chargeport switches. With the mod shown below and a Combo Solution Charge Cable if you've got most any of the A123 capable balance chargers out there you'll be good to go with no muss and little fuss.. and no extra holes in the plane. Same goes for you owners of FMA's single lead chargers.. do the switch mod shown below and you are good to go with A123's . The idea is to set up an A123 system without a separate Univ Chargeport on the plane or separate cell balance tap on the pack. With a quick modification, a standard HD Chargeport switch can be bent to the task. Notes on Binding with Modifed Switches: Most all HD chargeport switches are set up with three wire feeds to the RX, the original intent was to enable the 'DSC' feature available on top end 72 MHz Tx's. 'DSC means 'direct servo connection'.. it gave you a means to power up and actuate the Rx and servos on the plane without actually 'transmitting'. Early on, this switch feature also enabled 're-binding' via the switch chargeport on some 1st generation 2.4 systems that would lose 'bind' fairly often. In a world filling rapidly with second and third generation 2.4 GHz radio systems the DSC feature is not often required for binding and 2.4GHz Rx ‘re-binding’ in the plane is not common. 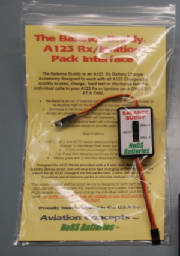 If you find yourself needing to 're-bind' with the Rx in the plane, it can be quickly accomplised with an aileron extension plugged directly into the Rx's 'Batt/Data' port and moving the two wire feed from the switch to an 'Aux' port on the Rx to power the Rx during the process. Note that currently all initial 2.4 radio binding is normally done on the bench before the Rx is installed and that current versions of 2.4 radio gear rarely requires re-binding at the field. If you do find yourself needing to bind or re-bind, you won't be able to do it via a modified switch's chargeport; you must use an aileron extension plugged directly into the Rx. In any case, most HD switches are equipped with that 'third' wire.. it's a 'signal' lead and we need to remove it from the plug that goes into the Rx so we don't put power to the Rx on that lead. To remove it you need a razor knife and a bit of electrical tape. 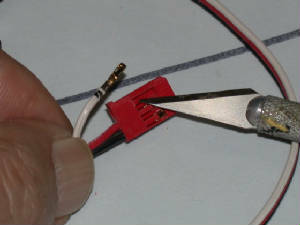 With this mod, we're going to turn your switches 3 wire Rx power feed into a 2 wire power feed. Check the photos below..
Ok, Now your HD chargeport switch is ready for use with a NoBS A123 pack with a single HD 3 wire combo feed. No Univ Chargeport required.. just use the switches chargeport with a single connection to your Generation 2 charger. If your considering switching to A123 Rx packs in an existing project, you don't yet have an A123 charger and you want to use your existing switches.. this is how it's done. Note that failing to pull that signal feed wire to the Rx from that plug will likely damage your Rx.. so don't attempt this without first modifying that plug. On the plus side.. no extra holes and extensions in the plane and the A123's along with a 2nd Generation charger like the FMA Multi-4 make this an exceptionally easy, neat and clean setup in any aircraft with any pack configuration... parallel, single or ignition. Just pull the 'signal' feed to the Rx from the switch, drop in the A123's, hook up a Combo Solution Charge Cord or standard JR/Univ to FMA adapter to your charger and you are good to go for balance and fast charging, all through the switch chargeport! Q: I like this.. what do I order, what connectors should be on the pack? You need an NoBS A123 Combo Solution Charge Cable if you have a two cable balance charger or an FMA to Univ adapter cable for FMA Cellpro or Multi 4 chargers. 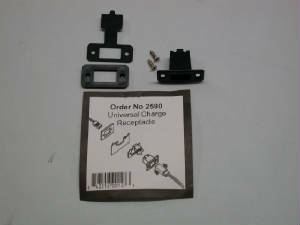 The pack should be ordered with NO balance tap and WITH the '20g 3 Wire Combo Univ' for the pack feed. Be sure and read thru our A123 FAQ for important info on balance charging! Most folks that use parallel setups can instantly take advantage of the layout shown to double the flying capacity and vastly improve redundancy. Just use two packs with our Combo 20g power feed as shown above, and a pair of our Custom Combo Ultraswitches w/ 18g JR output (or mod your own three wire switches) and you are good to go.. simplest, cleanest setup possible for a fully redundant parallel pack and switch system. All the benefits of the single pack, single connector system, times two. Nothing could be easier. Don't like looking at two switches on the side of your plane? Eyeball our outstanding Switch Hides, available on or Chargers & Accessories Page. Concerned about running without a 'battery backer' or an isolation curcuit? Click on this text for a refreshing bit of common sense advice regarding simple parallel systems. These are very popular setups for aggressive 3D flyers and it's also a handy way to improve current handling ability without a second switch or pack. Both the switches below can deal with high current drain and can handler up to 4 amp charge rates, right through the switch chargeports with the Combo Solution Charger Cables. * This is our new HD Combo Solution UltraSwitch developed exclusively for us here at NoBS for our A123 packs set up with a single Combo 20g three wire power feed. The switch has a 20g single three wire twisted input, an exact match for the heavy duty 20g three wire feed on our packs. 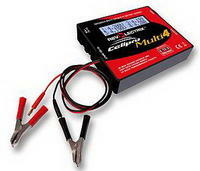 Eliminates the need for a separate input for a balance lead. Like the Nano Switch above, it has dual outputs to the Rx, outstanding for spreading out digital servo current loads common with Giant Scale Aerobatic routines. It's also avaiable with a single 18G JR/univ output, making it perfect for use with ignition modules or parrallel pack/parallel switch setups. Neater still, and built by ElectroDynamics exclusively for us. Pack Cabling Requirements: NO Balance connector and one Combo 20g three wire twisted power feed. That's it! There's more than a few folks out there with really BIG setups, using power expanders, soft switches and a host of current distribution devices intended to deal with massive current loading outside the capapbilities of your average R/C system standard connector set. We've got you covered too. Most of you use either Deans, EC3 or Multiplex connectors and heavy 16 or 14g power wire to deliver current to the power distribution system. For you folks, you'd use the 'Standard' pack cabling (that's WITH a seperate JR/Univ balance lead on the pack) system and install a seperate charge port to get access to the packs for balancing and checking via that lead. We have the packs with Deans, EC3 or Multiplex and will set the leads up for whatever lengths and guage you need, just vist our A123 packs page to order. Quick access to your NoBS 6.6v packs individual cells for checking cell balance or charging indivdual cells. Comes with Univ system connectors for direct access to any NoBS A123 pack. A must for correcting QUICKLY a major cell imbalance at the field without waiting for a balacing charger's 100 to 200ma 'balance' charge rate to get the packs individual cells back in balance. For more info on how and when to use the Buddy, click the link below. You may have noticed the red asterisks and lines on some of the items above.. they indicate packs, switches and charger cabling all designed to work together seamlessly as part of a complete A123 System. For the majority of folks out there who are looking for a 'drop in solution' for their charger and our packs in their birds, these will work beautifully. Below, I've put together a few 'starter' packages at a discount that combine Our Combo Charger Cable, Our A123 6.6v Rx or Ign packs w/20g Combo Jr/Univ power feed and our new custom Combo Solution Switches with dual or single JR/Univ outputs. An excellent setup for 20-30% Aerobatic and Warbird applications and it's designed to work with over 90% of the chargers out there (check your charger manual for JST-XH compatibility). Choose any of the various Combo's below and save some bucks. The one-click Combo Solutions.. now what could be simpler than that? Includes the Combo Solution 18" Charger Cable, 2500 6.6v pack with Combo 20g 3 wire JR/Univ power feed and a NoBS Combo Solution UltraSwitch with your choice of single 18g JR output to the Rx or Dual 22g JR outputs to the Rx.. Got a big gasser with an ignition engine? Want to build up a parallel pack system at a discount? Here's the perfect start. Combine this offer with either or both of the other Combo Deals below and you have the key building blocks for a multiple pack system for your bird at a discount. That pretty much covers system setup basics for A123's. Up at the top of the page are links for our A123 Packs, A123 Care and Feeding FAQ and for our Chargers and Accessories page. Our A123 packs page also has A123 rated switches, cables and accessories, just scroll down a bit. If you found this info useful.. tell your friends and link the site. I don't do any formal advertising.. this little company runs on word of mouth and on satisfied repeat customers. I hugely appreciate your business! 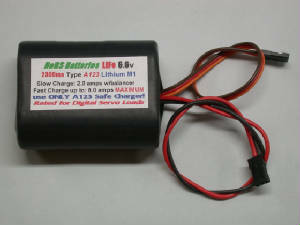 *A123 & Nanophosphate are trademarks of A123 Racing, Inc. All A123 cells and chargers assembled and distributed by Hangtimes Hobbies and NoBS Batteries are acquired from A123's sole licensed US Distributor. 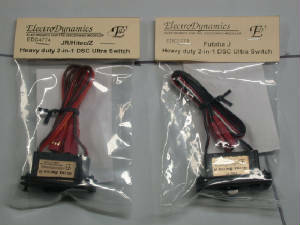 All rights to A123 technology and trademarks reserved by A123 Racing Inc. ED, Nano and Nano Ultra Switch are trademarked products of ElectroDynamics Inc. FMA and FMA Multi-4 are tradmarked products of FMA Incorporated.